The spring has finally arrived, and Easter is just around the corner. The recipe presented here has its roots in the observance of Lent, during which time the chef of the house might prepare a vegetarian stuffed dolmades. My mom certainly did. I remember her preparing one of two basic variations: filled either with only rice, or with a mixture of rice and finely-chopped mushrooms. As you might imagine, both are simple and neither taste like much. This might serve as a reminder that you are sacrificing something (meat) during Lent. However, one should also have the option to give up meat without giving up the flavor. We have two main types of 'sarmale' in Romania, where I am originally from: some are rolled in pickled cabbage leaves and others are rolled in young vine leaves. While the stuffing is usually similar for the two, that's pretty much the only thing they have in common: the former are usually sweet and sour (sweet from the meat and tomato sauce and sour from the pickled cabbage leaves and/or sauerkraut), while the latter have a very distinctive texture from the thin vine leaves. 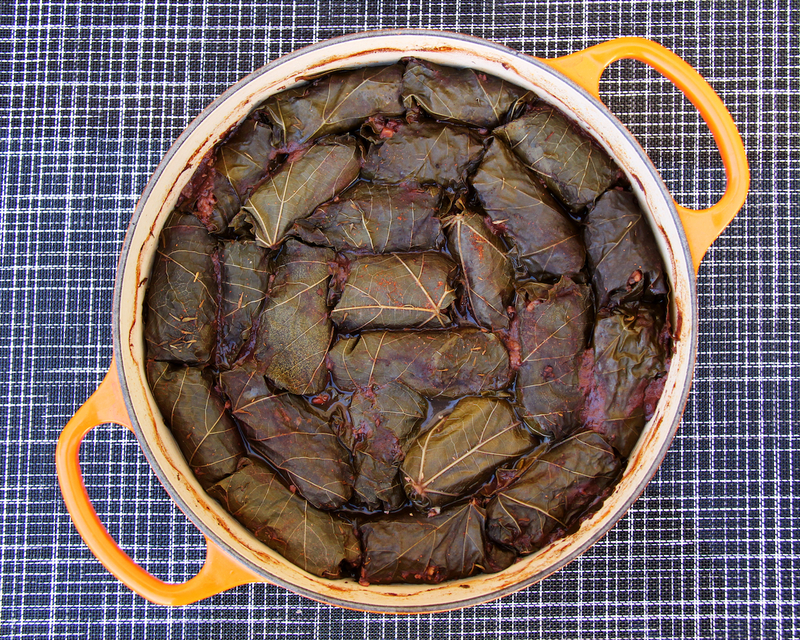 The latter is a special treat around Easter and during the spring in general, once the vine leaves are fresh and tender. - Bring two cups of water to a boil. Rinse the rice separately, then add it to the boiling water, reduce the heat to low, cover with a lid, and keep on cooking for 20 minutes. Make sure the pot you use is large enough to allow the rice to expand without overflowing. When ready, gently stir in the rice with a fork to increase its fluffiness. Set aside and let it cool. - Meanwhile, boil the red beet (about 30 minutes). Peel and set it aside to cool down (you can submerge it under cold water to speed up the process). Once you can handle it, shred it through a grater. - While the rice and the beet are cooking, peel the carrots and squashes and shred them through the grater. Also, mince the red bell pepper and the walnuts (no meat in this recipe, but walnuts add some proteins). - Peel and mince the onion and the garlic head. - Add the bell pepper, onion, and carrots to a pan, add a bit of oil, and fry on medium heat for 5-10 minutes. This helps bring out the flavors. - Break and beat the four eggs, separately. - Chop the dill and parsley. - Now to mixing everything: in a large pot, mix the rice, shredded beet, bell pepper, onion, carrots, garlic, olive oil, chopped dill and parsley, tomato sauce, eggs, walnuts, and squashes. Add salt, pepper, thyme and paprika, to taste. This forms the tasty filling for our dish. - Coat a large pot with a bit of oil. This is where the cooking will happen, and we don't want to dish to stick to the bottom. Please a few bay leaves at the bottom of the pot, for flavoring. - Take one grape leave at a time. Place a tablespoon or more of the filling in the center (or more, depending on the size of the grape leave). Carefully wrap the leave around such that the filling cannot escape. Place carefully in the pot, and pack them tightly. Proceed to the next grape leave (expect the process to take a while, the exact amount depending on your dexterity). - Mix the can of diced tomatoes with water in a separate bowl. Pour the mixture over the sarmale into the cooking pot. If needed, add more water until the sarmale rest under about half an inch of liquid (some of this liquid will evaporate during cooking). - Cover, and bake at 400F for one hour. - Enjoy hot, usually with bread, sour cream, and maybe a hot red pepper (if you like your food spicy). - The dish requires ample preparation time, so it's not very common (usually reserved for guests or special occasions). I find the best presentation to come from the number and the pattern formed by the tightly packed sarmale in the dish, so I usually pick a nice pot to cook the dish in, then serve them directly from the pot. Even if I transfer them to a plate, I think the best presentation involves a large plate that accommodates a good number of sarmale. - If you feel something is missing in just numbers and pattern, it's probably color (cooked grape leave are not very colorful). Consider adding some fresh colors: red (a hot pepper or some paprika), white (sour cream), and maybe greens (e.g. a branch of fresh thyme). Alternatively, you can use dill instead of thyme, but I'd chop it and mix with the sour cream, such that it pops up more.